The Temple Juggling Club entertains students across campus with complex routines. It’s 4:30 p.m. on a Tuesday, and a group of six students start to arrive in Annenberg Hall’s atrium. Moving the tables and chairs out of the way, they create a space to perform. A student takes out a radio and places it on top of a table, and with music playing, other students grab various props. Without missing a beat, they begin to juggle. These skillful students are members of the Juggling Club, one of the newest additions to Temple’s long list of student organizations. Bianca DiMaio, a sophomore film and media arts major and president of the club, created the organization with the help of two friends. DiMaio was part of a juggling club in her hometown of West Chester, Pa., but when she came to Temple, there was no group for her to join. Then, she went around campus juggling by herself. Tyler “T” Lawrence-Simon, a junior theater major, shared DiMaio’s interest in juggling and was one of the first members of the club. Another early member was Nakia Brown, a sophomore math major currently taking time off from school. Bianca DiMaioa, president of the Juggling Club, manipulates a Chinese yo-yo. The club performs its tricks throughout campus (Nic Lukehart/TTN). “I noticed a girl with a backpack with clubs sticking out the back of it. I ran up to [Brown] and asked if they were juggling clubs, and when she said ‘yes,’ I told her about my plans to start an organization and shouted, ‘We should work on this together,’” DiMaio said. With the help of Brown and Simon, DiMaio started the Juggling Club and used Simon’s idea to have its meetings in the lobby of Annenberg Hall, where students didn’t seem to mind the distraction. As the weather got warmer, they juggled in front of the Bell Tower, attracting more students and growing from only three to 15 regular members. Now an official organization with Kimmika Williams-Witherspoon as its adviser, the Juggling Club has big plans for the spring semester. The group is currently looking for new members – no experience necessary – and plans to make its presence known on campus. “We’re trying to do Spring Fling, and once the weather gets nicer, we’ll go outside more often,” DiMaio said. The Juggling Club currently meets twice a week on Tuesdays at 4:30 p.m. and Fridays at 2:30 p.m. Members said they also hope to perform in talent shows and make a trip to the Philadelphia Juggling Festival in October. For most members of this group, juggling has become a fun hobby. However, there is the potential to make it much more. DiMaio has used her juggling skills to make extra bucks at parties. Nicole Ingenbrandt, a sophomore education major and treasurer of the Juggling Club, uses juggling as a tool to attract the attention of the pre-schoolers she works with. Junior theater major London Summer considers juggling to be a desireable skill set. “As an actor, anything that I can learn and say is a skill will help me in landing roles,” he said. Josh Garcia, a freshman film and media arts major, said he wishes to make juggling more well known as an art. Juggling alone requires patience and practice, and each prop used or trick performed calls for its own level of skill. To juggle the small balls, for example, is much easier to learn than the clubs. Other juggling props include rings, beanie bags and the diablo, also known as the Chinese yo-yo. The diablo is one of the hardest to learn, DiMaio said. 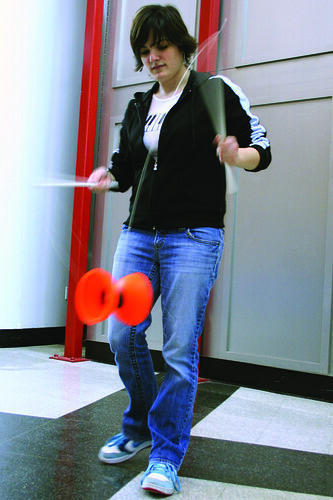 Contact juggling is another form of juggling, which is fairly difficult, members said. Although the minimum requirement is one ball, the juggler must manipulate it so it’s always in contact with the body. This technique mostly involves rolling the ball around on the hands and arms to create a visual illusion. However, DiMaio said she believes anyone can learn to juggle, and the Juggling Club is willing to teach anyone who might be interested. With the exception of DiMaio, who’s been juggling since the eighth grade, most members recently learned how to juggle. “I’ve known Bianca since freshman year, and she used to always tell me about this club. I finally went to a meeting this past September, and I learned how to juggle in two hours. Since then, I’ve been a regular member,” Ingenbrandt said. The vice president of the club, sophomore and computer science major Michael Maurizi, learned how to juggle last April when Summers invited him to a meeting. Now, Maurizi is able to teach others his talent. He recommends that anyone who is interested stop by and learn to juggle. Christeen Vilbrun can be reached at christeenvilbrun@temple.edu. Students and faculty shared their experiences from Sept. 11, 2001 yesterday in Annenberg Hall. A $1.2 million gift from the Kal and Lucille Rudman Foundation will make TUTV produced in Annenberg Hall possible beginning in the Fall semester.